Here are the top trends from the 2017 Global Digital Outlook Study, which surveyed 126 agencies and 90 marketers on their top desires for 2017. 75% of client-side marketers and agency leaders believe that being a “digital” agency will be irrelevant within the next 5 years. Digital marketing is more crowded than ever before, which means client-side marketers can hold higher standards for agencies. But, marketers are also more educated on the value of digital services. The new 2017 Global Digital Outlook Study from SoDA and Forrester digs into all of these trends to learn what matters most to agencies and clients. The study finds the ongoing growth of digital marketing has led to two opposing, high-level themes. The bad news for agencies: Digital marketing service providers are increasingly common, as exemplified in the stat above. More agencies continue to add digital capabilities while 50% of client-side marketers use in-house teams for at least one type of digital marketing. “Digital” is becoming a standard expectation, not a differentiator. 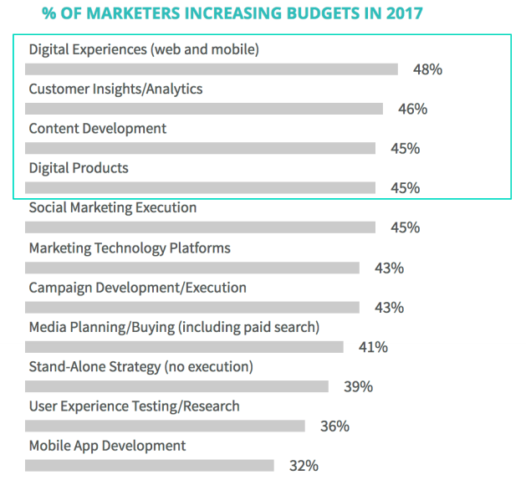 The good news for agencies: 48% of clients are increasing their budget for digital marketing by 15% or more in 2017. Clients understand the value of digital marketing, and they are devoting resources to back that up. But, even more importantly, the study shares details on specific expectations from 126 agencies and 90 clients. Clients have made data-driven strategies their number one priority. And, they feel that agencies need to focus on improving their creative and analytics services above all else. Here are some of the key findings. Clients were asked where they would be increasing spending. Their responses were relatively evenly distributed, but experience on digital products, customer insights, content creation and digital product development were the top 4. Clients are generally looking to devote more time and money to all digital media- content, PPC, social and the website/mobile app experience itself. There is ample opportunity for agencies to help with at least one area. The survey asked clients to select the strategies that would have the biggest impact on organizational growth over the next 2-3 years. 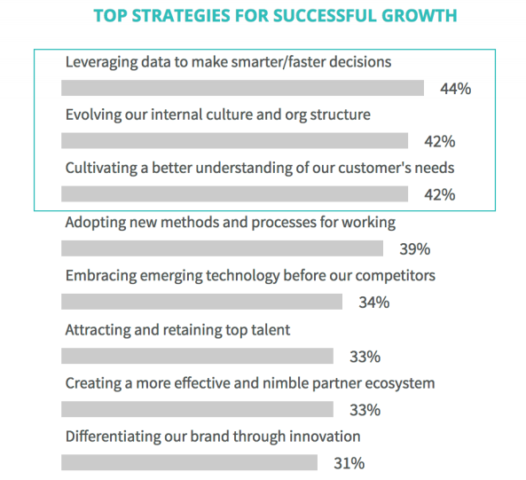 Clients chose data-driven strategies as their top growth driver. This probably does not come as a surprise. Over the past 10 years, every tool in the modern marketer’s arsenal has developed built-in analytics. Popular services like Google Analytics and HubSpot have made it easier than ever to get real-time feedback on marketing efforts. However, as you will soon see, agencies have not been able to keep up with data demands from clients. How Databox supports this objective: Agencies use Alerts, Goals and Every-Device-Dashboards to allow employees and clients to monitor marketing data in real-time. Clients can get custom updates on their KPIs straight to their phones without any effort. Clients were asked about where they would like to see a more developed offering from agencies. 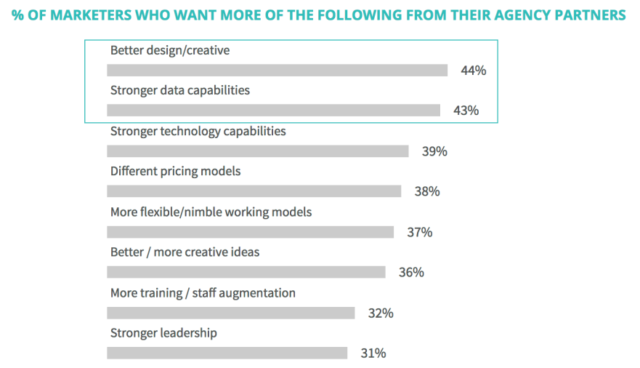 Clients named design/creative services and data capabilities as the two top areas for improvement. While more flexible/nimble working models and price were slightly less frequently mentioned concerns, agencies are on shaky ground with more than 1/3rd of the respondents. For the sake of retention, maybe it’s time for agencies to step up a bit? How Databox supports this objective: When agencies use spreadsheets and screenshots to share data, the client has a hard time following along. Agencies that use KPI dashboards find clients will get involved with their own data and feel connected to performance of marketing initiatives. Agencies were asked to choose the strategies they felt would have the biggest impact on business over the next 2-3 years. Per usual, developing and keeping employees was the number 1 priority, followed by innovation in service offering. 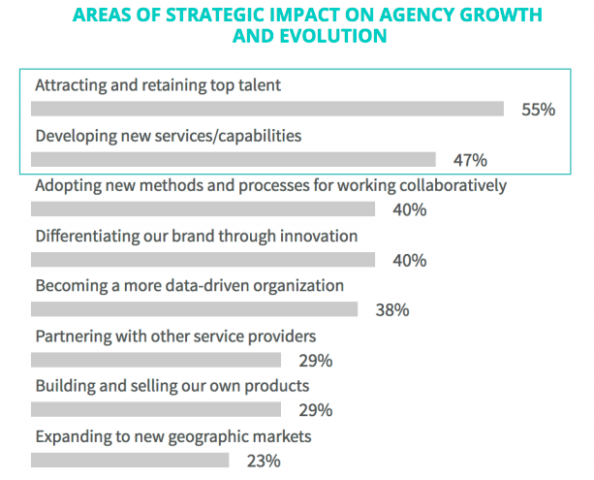 Agencies consistently list “talent retention” as a top priority. All too often, the industry requires grueling hours to meet client demands, which leads to burnout and employee churn. New services allow agency leaders to distinguish their brand from the growing crowd of digital agencies. Our training program, specifically designed for agencies also provides training on how to position, deliver and report ROI from leading marketing software programs like Google Analytics, HubSpot and SEMRush and up and comers like SeventhSense and VOIQ to name a few. Clients are trying to implement data-driven strategies across their digital marketing initiatives. They are devoting more money than ever before to these initiatives. When agencies do not meet these standards, clients may choose to do their digital marketing in-house. In 2016, marketers overwhelmingly declared plans to bring more digital marketing in-house. But, in the 2017 survey, most admitted they had made little to no progress on in-sourcing. There is still plenty of opportunity for agencies to show leadership and meet underserved creative and analytics needs for clients. You can read the entire 2017 Global Digital Outlook Study here.